"What's MESS? ", you ask. This morning I met with another charter member of MESS. We meet whenever our busy schedules permit. Do you know any of them? Maybe you are one of "them". I know I am. God has called us to minister encouragement and hope to fellow believers in the Body of Christ. After my friend and I met for breakfast we were both energized and encouraged to go out and make a difference in our world. We shared scriptures and some quotes that benefited both of us. My friend told me how Psalm 34 had buoyed him up this morning. I shared a thought from OUR DAILY BREAD and Chuck Swindoll's thought for the day from his desk calendar. Chuck Swindoll wrote, "There is not an achievement worth remembering that isn't stained with the blood of diligence and etched with the scars of disappointment." Discouraged today? Can't read God's Word or even pray? Do as Hudson Taylor did. Lie still in the everlasting arms of our mighty God and simply trust Him. Remember...when we get "home" we will realize that those blood stains, tears and scars produced an inheritance that will never fade away. Press on, weary child of God. We never walk alone. He is there every step of the way. "Cast ALL your cares on Him for He cares for you." - 1 Peter 5:7 or, as the David W. Fisher Amplified Version would state: "Release/dump/throw/unload EVERY SINGLE CARE into the everlasting arms of the mighty, sovereign God who loves you passionately and cares for you beyond your wildest expectations." Dear David.. I just discoverd Chuck Swindoll a couple of weeks ago on my car radio on my way home from work. Ususually I have my Southern Gospel cassettes on but for once I put on WDCX...Mr. Swindoll was talking about putting three people, just three on a paper.. that you would be praying for everyday...people who you wanted to be saved... "Don't miss one single day without praying for them". Good idea, eh? but I failed miserably...Your blog has reminded me of this, so why should I despair...I will try, try again!! I was talking to my sister today..She goes to Thorld South Gospel Chapel. Last night Mr. Macintee was showing pictures of one of the countries he had just returned from.. I forget where but anyways he is Chuck Gianotti's father in law I think.. Chuck was commended from the assembly there. What a small world,eh? I told Betty about Chuck's site so hopefully she will book mark it. I have already!! 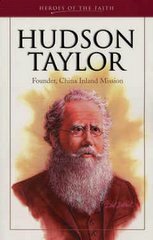 I wonder what Hudson Taylor would have thought about that Billy Graham speaking in tongues in his beloved country of China? that daily bread devotional just blessed my heart so much ... leo and i have been reading the RBC devotional together for most of our married life - it seems every day has some golden nugget of truth in it's pages!